Richard Irwin (Belper, United Kingdom) on 27 March 2009 in Plant & Nature. Lovely! Great greens. And I like the three stages of the flowers, too. Beautiful flowers, love the colours. Beautifully captured, colours are vivid, the stages of the flowers is really a nice touch, well shot. Love it. Wonderful emotional lift in spring . . these sudden eruptions of life from the still earth. Beautiful. Perfectly portrays spring! Love the yellows and greens and bright sunshine! Really nice composition. Richard, they are wide open and huge abundance around here! A major sign that Spring is truly upon us! Beautiful depth! Really great colors. i also really like the fence in the background. 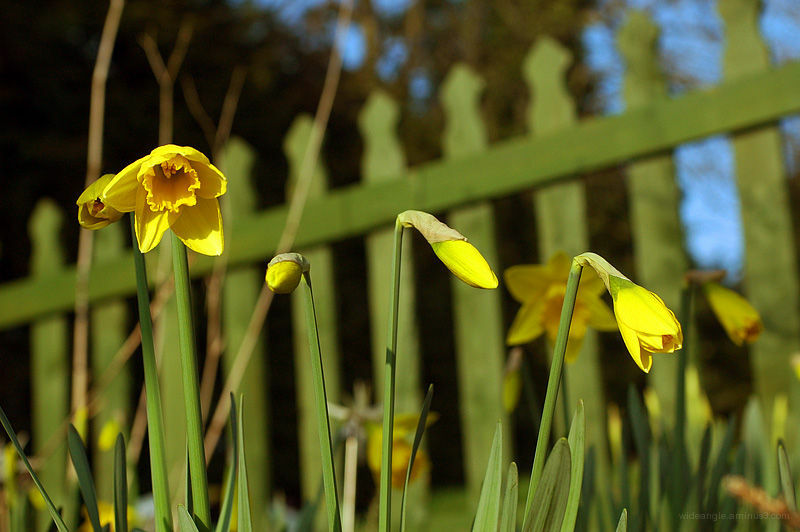 Oooh, nice daffodil shot!! They're among my favorites. Lovely, deep colors. It really is a pretty shot. I also like the green fence. Excellent, Richard... and the unusual green fence makes a great background. These shots are going to make me get out and do some spring images myself. Perfect composition, the background is amazing !